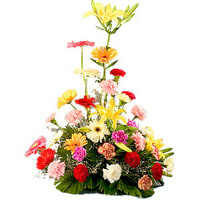 Celebrate with your loved ones as you send online this Stunning Arrangement of Beautiful Mixed Flower with Impression of Love and increase happiness in their lives. Large Mixed Flower Arrangement with Cadburys Celebration pack. Large Mixed Flower Arrangement with Three Colourful Balloons with Teddy. Large Mixed Flower Arrangement with 500grms Assorted Sweets. Large Mixed Flower Arrangement with 16 pics Ferrero Rocher chocolate box.